A 47-year-old man and 54-year-old woman from Crawley are being questioned over multiple drone sightings that brought Gatwick Airport to a standstill. They were arrested on Friday evening and were being questioned on suspicion of disrupting civil aviation "to endanger or likely to endanger safety of operations or persons", Sussex Police said. 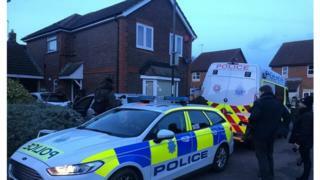 The force said it was deploying "a range of tactics" to prevent further incursions from drones following the arrests. Supt James Collis said: "We continue to urge the public, passengers and the wider community around Gatwick to be vigilant and support us by contacting us immediately if they believe they have any information that can help us in bringing those responsible to justice." A Gatwick spokesman said: "Many people will be due to fly today and there will be longer delays perhaps. "But broadly things are going in the right direction. By the end of the weekend, things should be back to normal." Vivienne Shorrock said she was "relieved" to have avoided the disruption. "Some people have suffered real losses by not getting where they want to go to be with family," she said. Her husband David joked the drama was a "nice distraction from Brexit". Passengers have been warned to expect some delays and cancellations and were advised to check with their airline before travelling to the airport. About 1,000 aircraft were either cancelled or diverted and about 140,000 passengers were disrupted during three days of disruption. But John Murray, professor of robotics and autonomous systems at the University of Hull, told the BBC the problem with this system was "you can find the drone but not the person operating it". "You can take the drone out of the sky but you won't capture the person and that's what you want to do. "You can get a second-hand drone for between £200 and £300 so if you take it down, they can just go out and buy another one," he said. A handful of flights due to arrive into Gatwick on Saturday were cancelled, according to the airport's website, including an easyJet service from Milan-Linate and a TUI flight from Bridgetown, Barbados.